Looking towards a homestead at sunset in western Nuerland with a garden in the foreground, much of the crop having been harvested, only stalks remaining. This fits with Evans-Pritchard's fieldwork of 1936 which co-incided with the harvest of the first millet crop in October. Note on print reverse ms pencil - "02 10" & print front border ms ink - "NUER IV/44"
Morton, Chris. 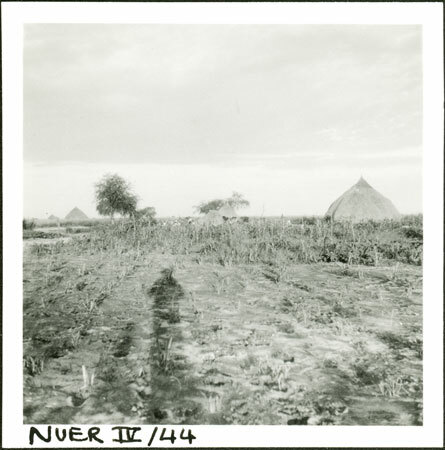 "Nuer homestead and garden" Southern Sudan Project (in development). 03 Jan. 2006. Pitt Rivers Museum. <http://southernsudan.prm.ox.ac.uk/details/1998.355.170.2/>.